New York’s Fearless Girl statue is likely to move to the New York Stock Exchange, according to a city representative knowledgeable about the pending relocation. The bronze sculpture by Delaware artist Kristen Visbal has been a popular attraction since it first appeared in Manhattan’s Financial District on March 7, 2017. Depicting a defiant girl with chin out and hands on her hips, the statute was placed in a public plaza, Bowling Green, at Broadway and Morris Street. It stands opposite a much larger sculpture installed in 1989, Charging Bull by Arturo Di Modica, as if daring the bull to run at her. 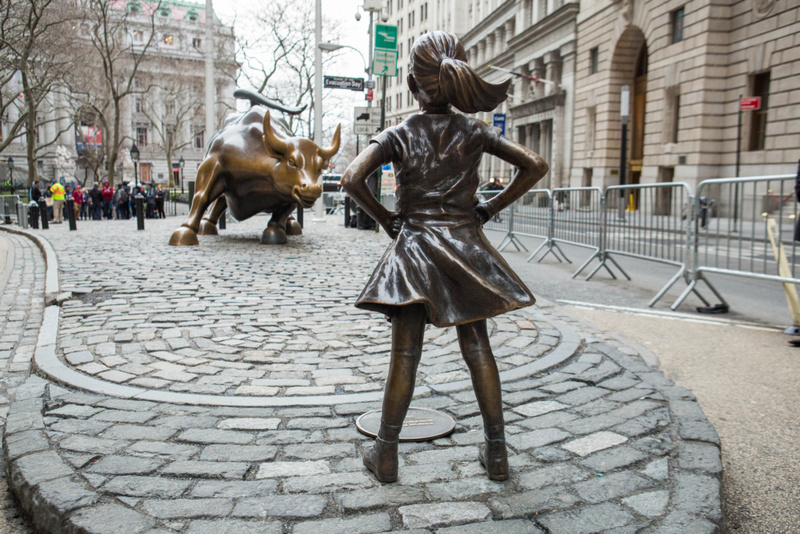 Fearless Girl was commissioned by State Street Global Advisors to highlight the company’s initiative to bring more women onto corporate boards. The firm wanted it in place by March 8, International Women’s Day, which commemorates the movement for women’s rights. The city initially allowed the statue to stay in place for several weeks under a temporary permit. Mayor Bill de Blasio later announced that it could stay at its current location until March 8, 2018. With that deadline approaching, city officials said last month that the sculpture would remain on public view somewhere in the city, but not at Bowling Green, because the space isn’t large enough for the amount of traffic and number of visitors it draws. Although numerous sites have been considered, the New York Stock Exchange at 11 Wall Street has emerged as the leading candidate, according to the city representative who is privy to the deliberations but not authorized to discuss the move. More details are expected before March 8. The city is also considering plans to move the Charging Bull statue, either to keep it with Fearless Girl or to make it separate. The bull initially appeared in front of the Stock Exchange in 1989 and was later moved to Bowling Green.